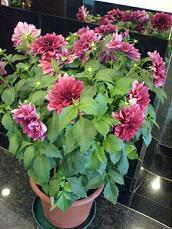 My office plant some "年花" ~ a good lucky flower for Chinese New Year. But, I don't know this is "牡丹花 or 勺藥花 = Peony", or they are the same? Anyway, some people believed if the flower grow strong and beautiful, this year will be good luck.